They charge through the back door wearing their toothy smiles and holding out their arms, ready for great big hugs from this Grams. For a moment, while I inhale their youth, I catch a glimpse of their father – a slight resemblance – in the shape of her face and in his silly, boyish smile. How marvelous! Wriggling out of my arms they dive into the toy box and Sister quickly emerges with a noble theme. 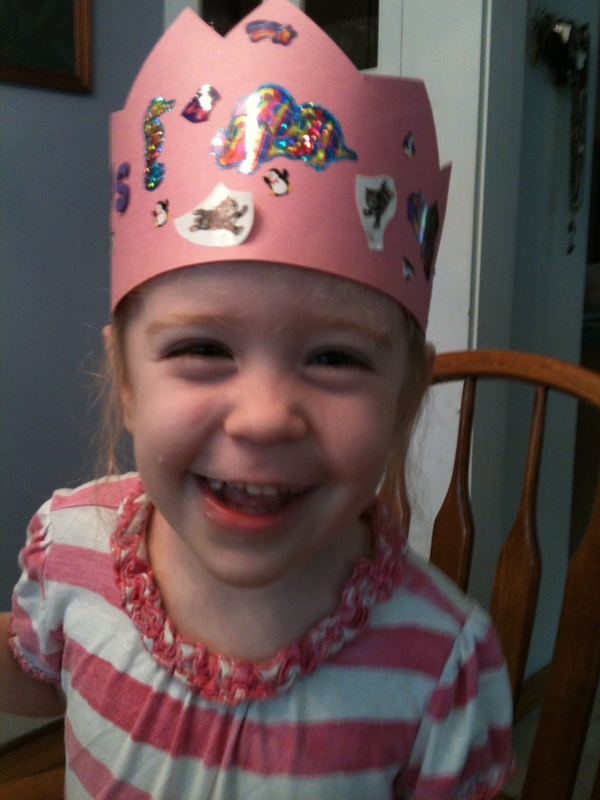 She proudly dons a princess crown, happily announcing her royal presence throughout the kingdom. Suddenly, Brother yanks the sparkling royalty from her head. Arms flail, tears flow, and the little prince and princess misplace their own identities. There are times we misplace our identities, too. Maybe someone yanks our rightful place out from under us or someone steals our innocence and then walks away. Sometimes though, we’re our own worst enemy – adopting those labels others slap on our backs – until we forget who we are and whose we are. We need reminding that we are sons and daughters of the King in need of a great rescue. Throwing colored paper, stickers, and magic markers on the table, Mother and I rescue the moment by transforming the dining room into the Royal Crown Factory. 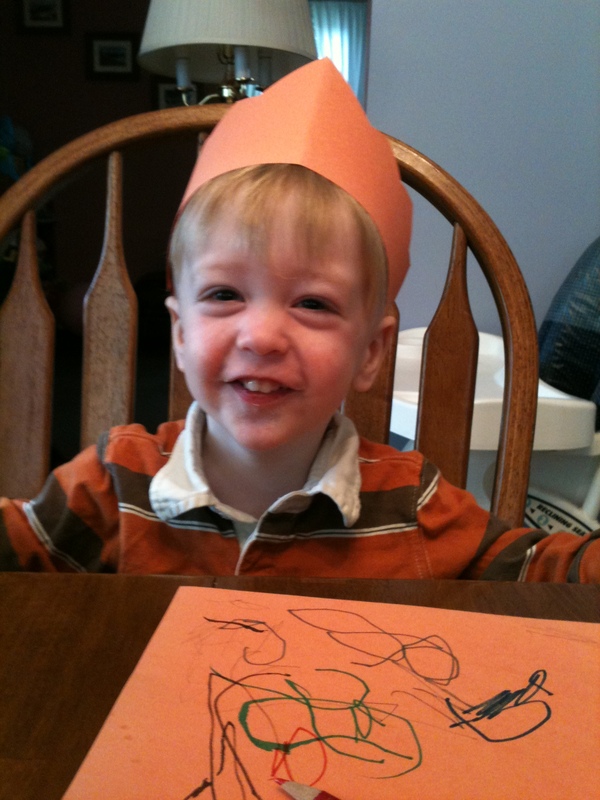 Their eyes fix on my hands as I trace and cut out two pointy, cut-out paper crowns. Busy hands and active imaginations quickly transform these plain shapes into sparkling creations. Smiles reappear across their little royal faces as they once again crown themselves prince and princess. Restoring our identity as sons and daughters of [God] the King takes more effort than simply donning a cut-out paper crown. But, when we allow God healing access to our hearts, he restores completely. When we quietly empty ourselves, surrender everything at God’s throne, that’s where He restores. That’s where God whispers our true identity into our souls and we remember our place as His prince and princess – heirs of His Kingdom. As we know God’s full, heart restoration we experience freedom in the release of our true identity in Christ. Are we ready for a great rescue, today? Instead of groping at our heart wounds, let’s lay them down and let God transform them – transform us – into all He intended us to be. Let’s find some time where we can get honest with God, weep and throw our temper tantrums then, settle down and listen for His heart whisper. As we daily surrender ourselves to God, maybe we’ll catch a glimpse of our Father in our faces as He restores us and we experience life in our true, Kingdom identity as God’s prince and princess. (To learn more about Dawn, please visit our contributors page). Simply beautiful Dawn…If we truly don the crown of Royalty, which the Lord says that we are…our stance changes and we can stand erect with a pride of belonging to the King of Kings and the Lord of Lords. Aren’t we blessed women to be able to be part of our grandchildren’s lives? Beautiful! This brought tears to my eyes and stirred my heart.